Perhaps this is what is running through the minds of Chin Kwai Fatt & Co at the moment; how to control the damage from the tweets that poked fun at Premier Najib so that the status quo can be maintained. Lets take a quick look at the various positions held by the Chairman of PwC Malaysia, Datuk Seri Johan Raslan. This is just the list for one person in PwC Malaysia, albeit one of the top people there. But it does serve to illustrate how extensively Chin Kwai Fatt & Co have built their network into the financial reporting, auditing and regulatory frameworks in this country. None of this will be possible if Putrajaya no longer views PwC Malaysia as the go-to-guys, as they are today. 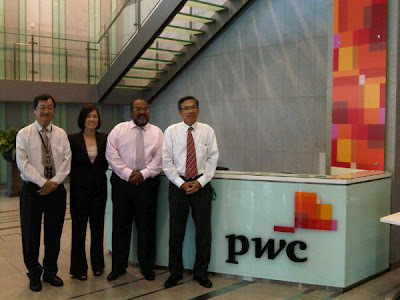 Has the fraudulent intent that PwC Malaysia has, finally been exposed for all to see. That their courtship of the movers and shakers in Putrajaya, and the various government investment arms, was sheer hypocrisy, hiding their disdain for the ruling government? There are lines that cannot be crossed when the status quo has to be maintained. Poking fun at the Prime Minister is definitely one of those lines, and the only way PwC Malaysia can outdo themselves now, is if there are also tweets by their people poking fun at the King. This is a betrayal of trust by PwC Malaysia towards the ruling government, despite the many GLC's and government projects for which they were allowed to be auditors and consultants. And the rumble is that Putrajaya is deeply unhappy with PwC Malaysia after the latest revelations. VU Kumar (2nd from right) and Chin Kwai Fatt (1st from right). Will VU Kumar be able to show his face in Putrajaya after his tweets? The government has stood by PwC Malaysia, despite their interference with the regulatory framework in the country, despite the many allegations of fraud against Chin Kwai Fatt & Co, despite the contemptuous submission of doctored documents to the justice system, but can Putrajaya continue to stand by and allow PwC Malaysia to get away with all these and more, when they actually bite the hands that feed them? There comes a point in time when the necessity to maintain the status quo is outweighed by the damage that the status quo can inflict. With the ETP under Premier Najib gaining traction, can Putrajaya continue to take the risk that comes hand in hand with the name of PwC Malaysia? We have seen how DRB-HICOM has learned that it is better to drop PwC Malaysia than to continue oblivious to the baggage they bring to the table. Will Putrajaya be forced to do the same?